16 MR. LINCOLN - cont'd what about your being linked to the Adolph affair?" 1ST READER "You are not so unlike Adolph in some ways. You are a man who sees himself as virtuous and acts according to the dictates of his conscience. You act like Adolph are useful to me." MR. LINCOLN "You failed to convince the council about Adolphs' return. You've already prejudice my return by having handled his." 1ST READER "With you I must not fail...it's true that I botched up the other case; but only because I use truth as a weapon." MR. LINCOLN "You said, I would be useful to you. Who are you?" 1ST READER "For the moment it is not important." MR. LINCOLN (rising out of his seat--indignant) "At this moment it is most important." 1ST READER (calmly-as a coiled snake) "If I tell you, it will shatter your image of yourself. I can't use you with a damaged ego. The full glare of the mirror maybe too much for you. If you, indeed, see me, you may discern yourself." 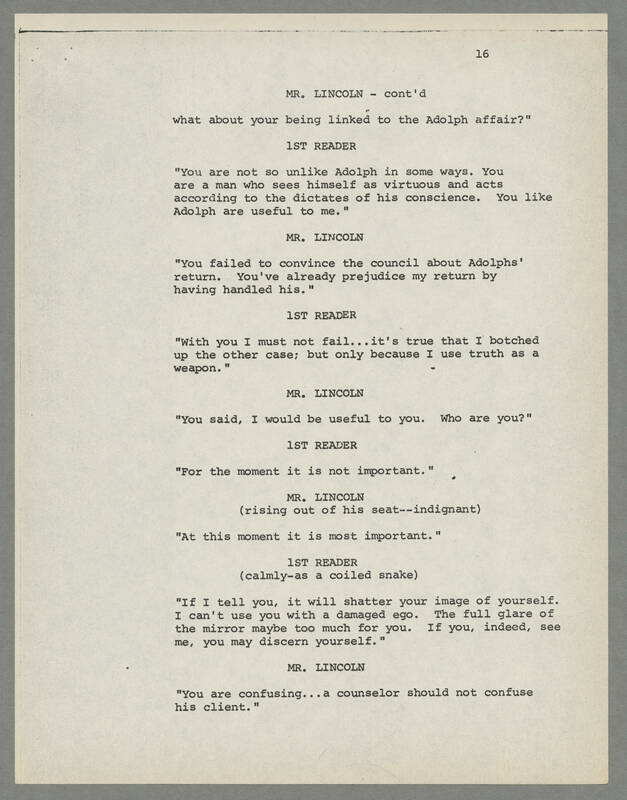 MR. LINCOLN "You are confusing...a counselor should not confuse his client."